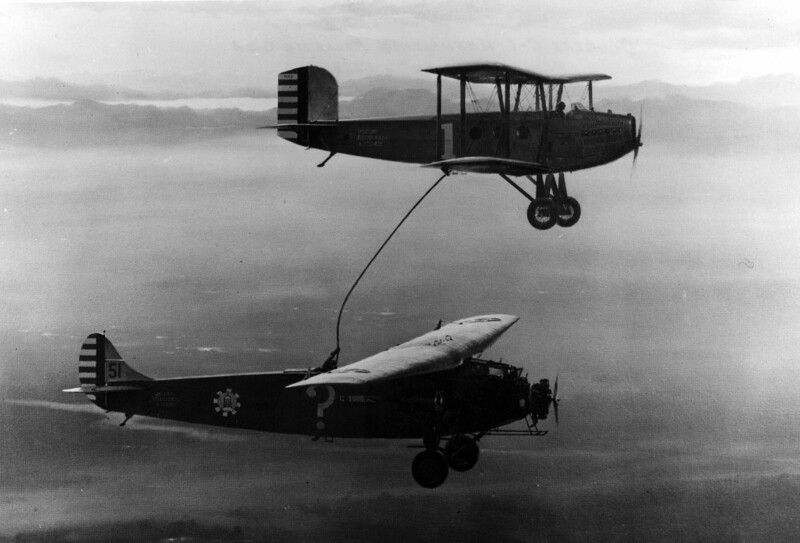 A 10,000-pound Fokker C-2A is refueled in flight by a modified Douglas C-1 transport aircraft during an operation dubbed "Question Mark," in 1929. Click image to enlarge. 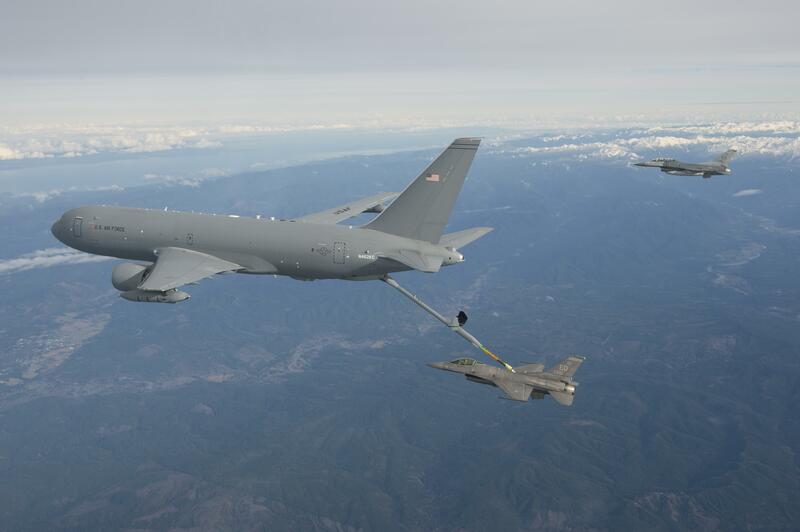 This is the first in a series of articles highlighting the history of aerial refueling and the important role aerial refueling has played in American military history. On Jan. 1, 1929, a tri-engined Fokker C-2 aircraft with a crew of five climbed into the southern California sky. This aircraft, dubbed the “Question Mark,” was not history’s first air refueling mission, but it played a crucial role in the beginning of air refueling efforts and the development of the U.S. Army Air Corps. The flight, born from the ingenuity of Airmen through their experiences in World War I, lasted from Jan. 1-7, 1929; a total of 150 hours and 40 minutes. The crew flew a 110-mile racetrack from Santa Monica, Calif., to San Diego, Calif. They also flew over the New Year’s Day Rose Bowl football game. 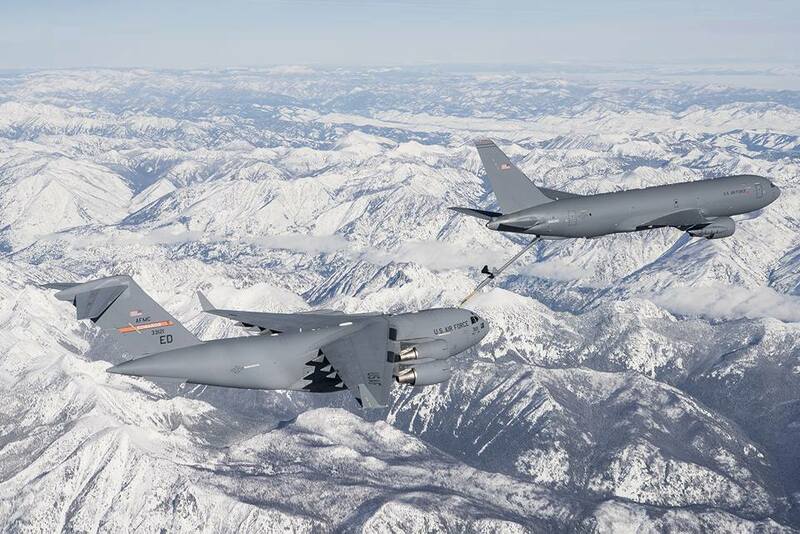 During the flight, they made 43 contacts with the tanker aircraft. Each contact lasted about 7.5 minutes, with the aircraft about 15 to 20 feet apart. Day-time contacts took place at an altitude between 2,000 and 3,000 feet, and the 10 night-time contacts took place between 5,000 and 7,000 feet. The receiving aircraft, the Question Mark, a Fokker C-2, was a high-winged monoplane with two 96-gallon wing tanks supplemented by two 150-gallon tanks installed in the cabin. The two refueling aircraft were Douglas C-1 single-engine bi-planes with two 150-gallon tanks for offloading and a refueling hose passed through a hatch cut in the floor. All told, the Question Mark received 5,700 gallons of fuel. During the contacts, the tanker crews also passed oil, food, water and other miscellaneous items, by means of a rope. Neither the Question Mark nor the two refuelers were equipped with radios because of the radios weight and unreliability,. The crews maintained communications via notes dropped to the ground, hand and flashlight signals, and written messages displayed by ground panels and both planes. 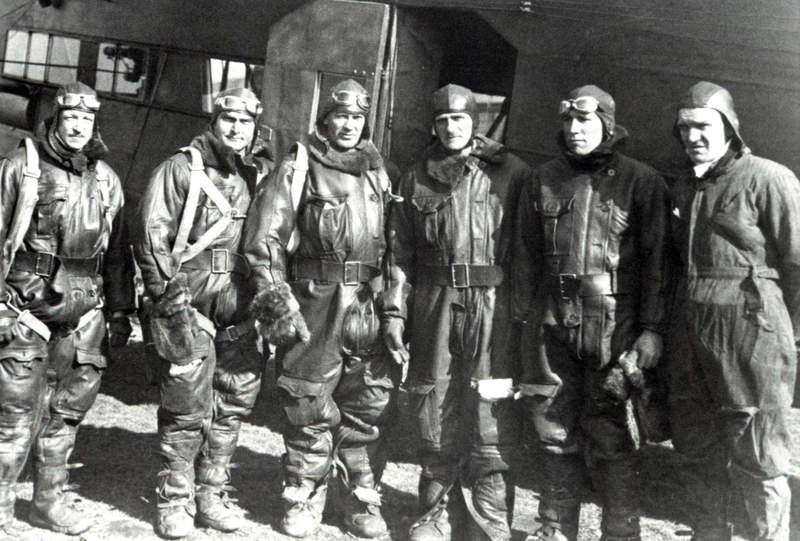 The Question Mark’s crew consisted of Maj. Carl Spatz (he later changed the spelling to Spaatz), Captain Ira Eaker, Lieutenant Elwood Quesada, Lt. Harry Halverson, and Staff Sgt. Roy Hooe. The crews of the tankers were Capt. Roy Hoyt and Lts. Auby Strickland and Irwin Woodring in the No. 1 aircraft, and Lts. Odas Moon, Joseph G. Hopkins and Andrew F. Salter were in the No. 2 aircraft. Capt. Hugh Elmendorf was in charge of ground operations and logistics for the mission. Air refueling was still considered by many to be a modern marvel, and it had humble beginnings. The first attempts were in 1921 with the employment of five-gallon gas cans when a U.S. Navy lieutenant, in the back of a Huff-Daland HD-4, used a grappling hook to snag a gas can from a float in the Potomac River. In another attempt, a wing walker with a gas can strapped to his back, climbed from an airborne Lincoln Standard to a Curtiss JN-4 to pour gas into the aircraft’s tank. 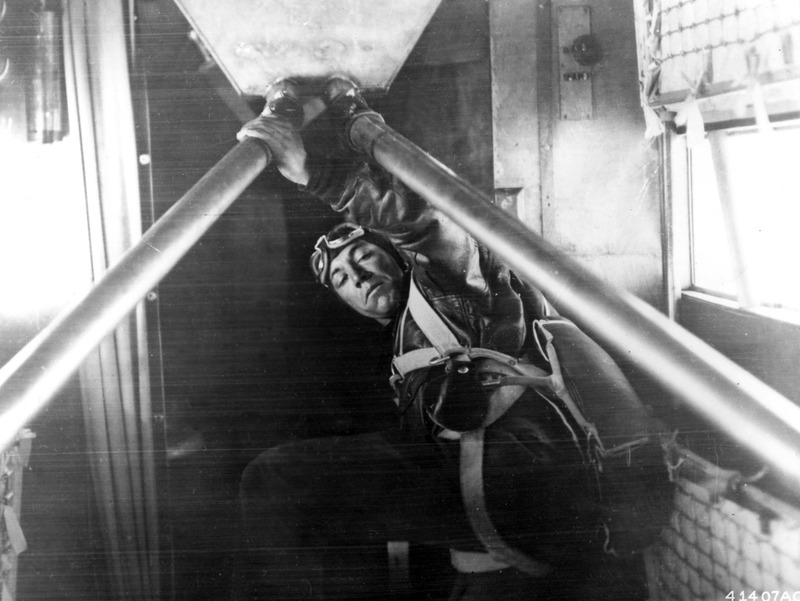 Lt. Elwood Quesada adjusts an aircraft gas line during a 1929 operation dubbed Question Mark where a 10,000-pound Fokker C-2A was refueled in flight by two modified Douglas C-1 transport aircraft. A large question mark was painted on each side of the receiver aircraft's fuselage, intended to "provoke wonder at how long the aircraft could remain airborne," according to Air Force history experts. During the operation, which began on New Year's Day in 1929 and ended 150 hours and 40 minutes later on Jan. 7, the Douglas refueling aircraft passed 5,660 gallons of fuel. All tolled, the tankers completed 43 sorties, 12 of which occurred at night. Click image to enlarge. While these two publicity stunts deserve mention, the first air-to-air refueling using a gravity-flow hose occurred in 1923. Earlier that year, the Army Air Service had equipped two de Haviland DH-4Bs with in-flight hoses. After installation, testing and preparation, the Army Air Service was ready to put it to use. On June 27, one of the DH-4s flew a six-hour-and-38-minute flight that included two air refuelings. However, the early days of air refueling weren’t without danger. Navy Lieutenant P. T. Wagner, the pilot of the refueler was killed during testing in 1923when the refueling hose became entangled in the right wings of the two aircraft. At that time, the Army’s budget was very limited, and the aviation branch in particular, had not recovered from the 1919 demobilization. The tests in 1923 attempted to show the practicality of air refueling with a flight demonstration that consisted of a 37.25 hour long record-setting 3,293 mile distance record set in August, and again with a border-to-border flight from Lamas, Wash., to Tijuana, Mexico, in October. 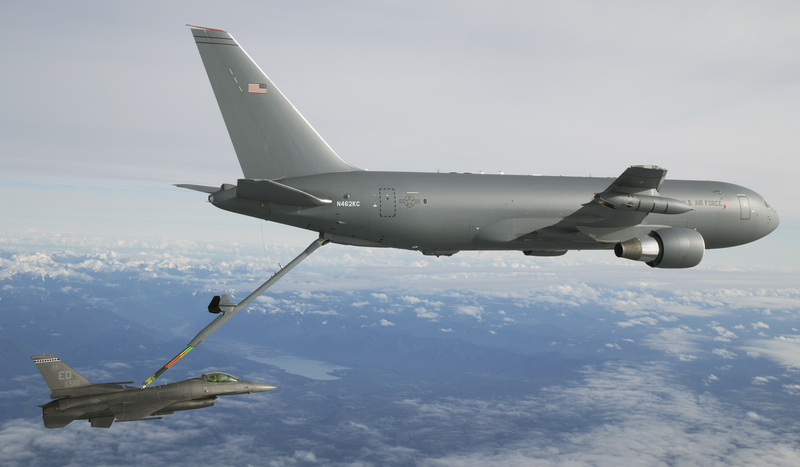 Between the budgetary constraints and the lack of an actual application, the air refueling testing slowly ground to a halt. The Nov. 18 accident caused the Air Service to stop it altogether. The idea for the Question Mark flight started with Lt. Quesada. Years later, General (retired) Quesada recalled that the mission was actually an incidental thought rather than a planned objective. Additionally, by 1928, Belgium had restarted air refueling experiments, picking up where other countries had left off. In the process, the Belgians set a new record of 60 hours and 7 minutes aloft. Also in 1928, a German aircraft, The Bremen, attempted to fly across the Atlantic. Captain Eaker took that idea a step further and began organizing the effort for a prolonged refueling technique, with a demonstration that would attract a lot of attention for the Air Corps. The Question Mark’s mission portended little militarily. Based on the success of this air refueling mission, the Army Air Corps scheduled a formal demonstration in the spring of 1929 as part of an Army war game maneuver. During the demonstration, a Keystone B-3A bomber was to fly, accompanied by a Douglas tanker, from Dayton, Ohio, on a simulated bombing mission over New York City’s harbor, and then return. 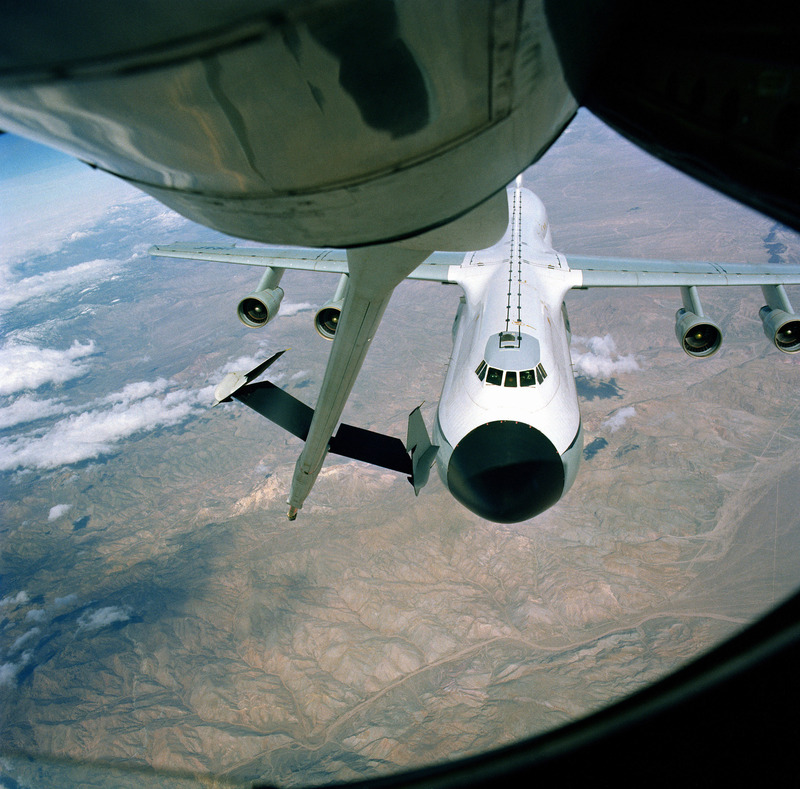 Refueling was to occur over Washington, D.C., during both parts of the mission. However, a network of thunderstorms between Ohio and Washington caused the aircraft to become separated. Icing conditions forced the tanker to make an emergency landing in Uniontown, Penn., where it lodged itself in the mud. The bomber successfully pressed on to New York City and returned to Washington without the tanker’s support. Pictured is the crew of the "Question Mark," including, from left to right, Lieutenant Halvorsen, Capt. Ira Eaker, Staff Sgt. Roy Hooe, Maj. Carl Spaatz (mission commander), Lt. Elwood "Pete" Quesada, and an unidentified crewmember. During a 1929 operation dubbed "Question Mark," a 10,000-pound Fokker C-2A was refueled in flight by two modified Douglas C-1 transport aircraft. Click image to enlarge. With this disappointment, the U.S. Army Department shelved the idea of air refueling for another 12 years. Still, in its primary objective, the Question Mark was a huge success. In fact, it captured the public’s imagination. American aviators were enthralled with the concept of air refueling. By May 26, 1929, a pair of commercial pilots in Texas, using a reconditioned Ryan Brougham monoplane, broke the Question Mark’s record with 172 hours and 32 minutes in the air. For the next several years, the record continued to be extended. It also sparked more interest among British aviators. One of them, Flight Lt. Richard Atcherly, invented one of the first formal air refueling systems.